Did you know that I discovered a comet in the fall of 1973? I was out with my venerable 8-inch Criterion RV-8 Dynascope Newtonian reflector, just hopping around the autumn sky, when I noticed stars weren't focusing sharply. Thinking the telescope's collimation was off, I aimed at a nearby bright star to check whether the silhouette of the secondary mirror was centered correctly in the star's out-of-focus image. After I tweaked things a bit, all appeared well, so I focused on that star to check things before moving on. Lo and behold, I saw a dim blur of light right next to the star! Checking things further, it wasn't an internal reflection or an optical aberration. Whatever I was seeing was real! And it wasn't on my star atlas; at the time, that was the Skalnate Pleso Atlas of the Heavens. 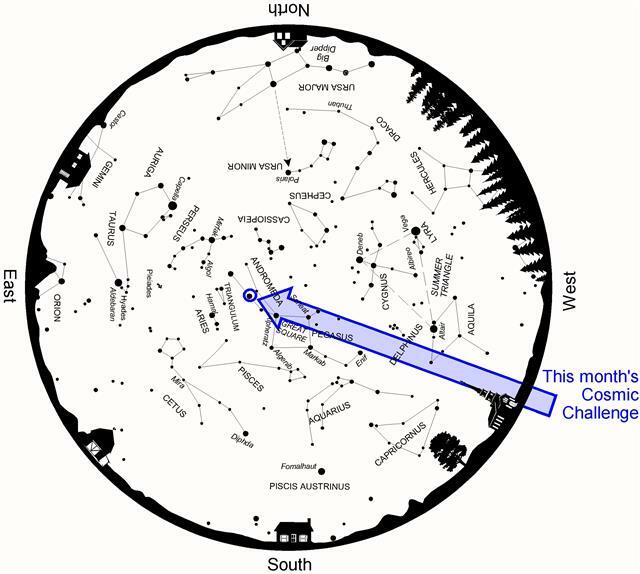 Chart adapted from Cosmic Challenge by Phil Harrington. Click on the chart to open a printable PDF version in a new window. My excitement was later dashed when I recalled reading something in Walter Scott Houston's Deep-Sky Wonders column about a little-observed galaxy in Andromeda. It turns out that I "discovered" NGC 404, a far-off dwarf S0 lenticular galaxy that happens to be just 8' away from my test star of choice that night, 2nd-magnitude Mirach (Beta [ß] Andromeda). So much for my immortality. NGC 404, nicknamed Mirach's Ghost for obvious reasons, has since gone on to be a favorite little treasure of mine. Since it appears so close to Mirach, locating this tiny system is easy enough. Aim your scope toward Mirach and - BANG - you're there. But now comes the problem of seeing NGC 404. Rated at magnitude 11.2, the galaxy is more than 4,300 times fainter than the star. As a result, even the slightest bit of sky haze or optical contamination by dust will scatter the star's light across the field and sweep away the galaxy's delicate image. 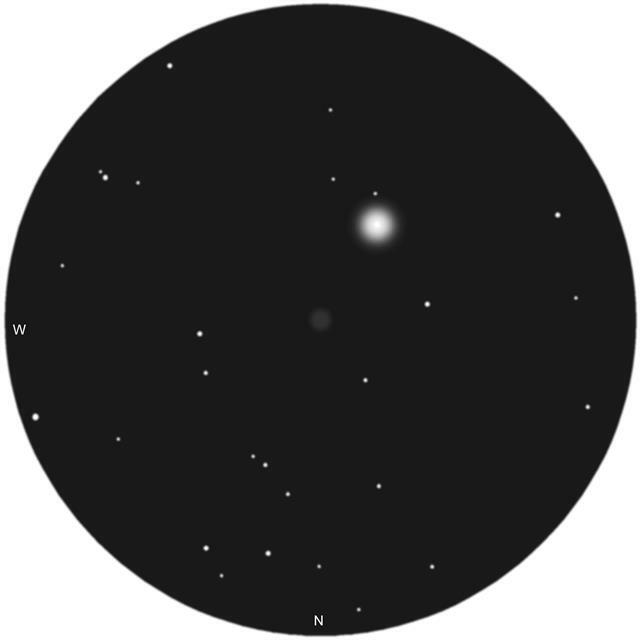 Above: Sketch of NGC 404 through the author's 4-inch (10.2cm) refractor. So, we need a strategy. Conventional wisdom suggests that in order to find a tough object so near an overwhelmingly bright distraction, we need to segregate one from the other. Select an eyepiece that produces a high enough magnification to do just that, and move Mirach just out of view while hunting down the galaxy. For my own 4-inch (10.2cm) f/9.8 refractor, I find that the best combination to spot the galaxy is a 12-mm Plössl eyepiece (sketch above). Even though the field measures more than 30' across, it is just narrow enough to let me move the star off to one side and spot the galaxy. If seeing conditions permit, try a similar set-up, but add a high quality 2x Barlow lens into the mix. That extra oomph should make seeing the galaxy a little easier, but only if the field is in sharp focus. Use Mirach to check that, but then wait a few moments after it has been moved out of view, so that your eye becomes dark adapted again. As for my discovery, well, it seems that William Herschel beat me to it by 189 years; he bumped into NGC 404 in 1784. I wonder if he was checking his telescope's collimation on Mirach at the time. Have a favorite challenge object of your own? I'd love to hear about it, as well as how you did with this month's test.  Contact me through my web site or post to this e-column's discussion forum. I once jokingly told a friend of mine that I had a "new comet" in view through the ASH 17" classical Cassegrain. It was in reality NGC 2261. Great story.. I think the objects we stumble upon when serendipity smiles on us are often our favorites. I "discovered" my first comet early on in my observing career. I was out on the Arizona desert early one fall morning viewing with my rather poor 60 mm. The comet was quite bright, I was quite excited for about 20 minutes. That was how long it took me to realize my comet was a ghost of Venus. Another early morning stumble. The galaxy cluster Hickson 68 is a favorite, found one lucky night and viewed many times since. It is almost directly on a line between Alkaid and Arcturus, about a quarter of the way from Alkaid. One particular morning, my sleep deprived brain got it backwards and I was looking about a quarter of the way from Arcturus rather than Alkaid and what should I find but NGC5466, a loosely packed 9th magnitude globular. I remember finding "a comet" many years ago too! I was so excited......until I looked at my charts and found out it was galaxy. It was such a let down. I still laugh about that night and the discovering of my comet. NGC 404 has been one of my favorites to take a peek at from time to time. My "comet" was in the mid to late 70's, found with my first scope, a 60 mm refractor with my then new "premium" eyepiece, a 0.965", 25 mm Edmund Kellner. I was viewing Jupiter and the bright image created a ghost in this haunted eyepiece which looked just like a faint comet, including a tail. I called an aunt who lived near Washington, DC (who shared my interest in astronomy). She called the U.S. Naval observatory, and a kind astronomer there turned a scope toward Jupiter and found, well, Jupiter and it's moons, no comet. Somehow through the exchange of information, I learned through him that Kellner eyepieces, were known as "haunted" oculars. Whoever this astronomer was, he was very gracious to this then budding stargazer. As for NGC 404, I've had some really cool views of this object in my mid-1980s pre ED glass 6" f/8 AP refractor. I can't say it's bright, but it's really cool to see this ghostly fellow hiding out in the glare of Mirach. True not shown on Becvar's atlas but is listed in Becvar's Catalogue on page 309. I've "discovered" several comets in the past that turned out to be real after checking out the current visual comets list. Always hoping to run into a real find but with the automated sky surveys today it is unlikely. I came across Mirach's Ghost's "cousin" last week during a star hop with the 20"; I am calling it Tau 1 Eridani galaxy. 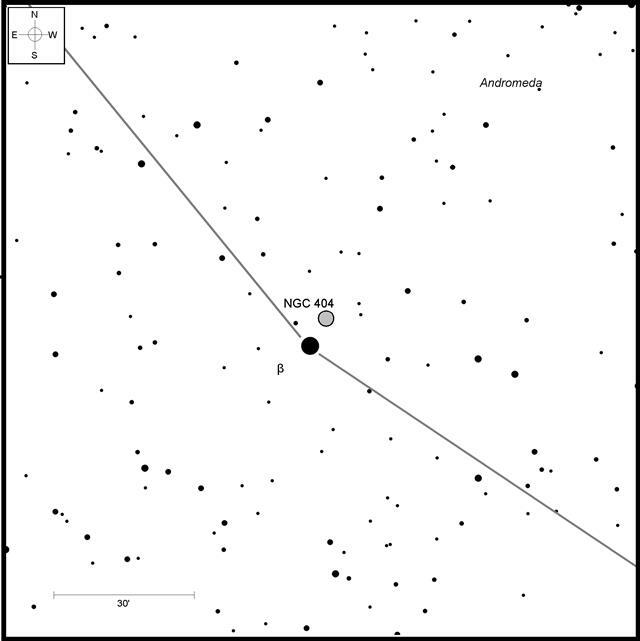 It is higher magnitude and smaller and therefore a target for large aperture, but similar in surface brightness to NGC 404. I confirmed my sighting on Monday night despite the presence of the moon still above the horizon, so that gives an idea about the brightness. Surprisingly I have not found it reported visually before. The galaxy is preceding Tau 1 Eridani by about 9 seconds and slightly to the south. It is not shown in atlases or Stellarium, and is not searchable in Wikisky although it can be seen in the glare of the star in Wikisky. The designation for the galaxy is LEDA 2816331. While it is listed as 15.79 B magnitude, it is at least a magnitude brighter than that in the visual. I put it as no dimmer than 14.8 based on a likely color index correction, and visually it seems somewhere between 14.0 and 14.5. From the Wikisky image I estimated the dimensions as 0.57' x 0.33'. Visual impression is elliptical NW/SE orientation with a stellar core. Searching the LEDA name in Stellarium with the deep star catalog shows an 11.85 magnitude star in the position with two 16 mag stars on the ends oriented the same as the galaxy's disk/major axis. So this "star" is likely the galaxy core, but with a dubiously bright magnitude. Stellarium sometimes double dips on color correction and the B-V is listed by Stellarium at 1.96...add back in 1.96 and you arrive at 13.8--close to my estimate. However, it is possible that there is actually a star there interposed onto the galaxy. The seeing has been too poor to discriminate. 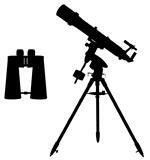 Anyway, should be a good target for scopes 16" and above, and might be visible in a 12". I've seen it in my Z10 many times. A wonderful sight. For me about as challenging as M109. I also have enjoyed the view in my new 18" scope. Makes it a bit brighter.